The three-day Battle of Chattanooga is one of the most dramatic turnabouts in American military history. It began on November 23, 1863, and when the fighting stopped, Union forces had driven Confederate troops away from Chattanooga, Tennessee, into Georgia, setting the stage for Union General William T. Sherman's triumphant "March to the Sea" a year later. Sherman wreaked havoc on Southern towns and freed slaves as his troops blazed a path of destruction, burning towns between Atlanta and Savannah, Georgia. It was a strategic victory because of the town's steamboat port and railway station. 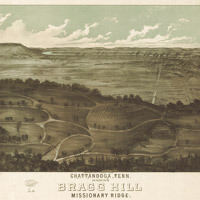 But in the early fall of 1863, rebel forces moved into the mountains and bluffs overlooking Chattanooga, trapping the Union Army.